As a industrial paint and blast job shop, we have the flexibility to structure our capabilities to meet the needs of our customers. We can do small run and production work for highly sophisticated applications such as critical military specifications and we are experienced in, and have an in house EPRI trained observer for Nuclear Power Plant rated painting. Our inspector is certified as a level III Inspector by the National Organization of Non Destructive Testing and Nace Level III. We also are an approved paint shop for the Minnesota Department of Transportation (MNDOT) as well as many other State DOTs. IPS, located in the northern suburbs of the Twin Cities, is a regional leader in the blasting and protective coatings industry. With our 60,000 square foot facility, we can blast and paint almost any size project that can be transported. IPS was founded in 1992. 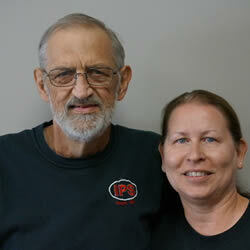 IPS Owner Richard Maciej with his Wife.